The fastest that a Formula One car goes during the season is about 210 MPH. That happens on the long front straight of the Monza circuit which is home to the Italian Grand Prix. 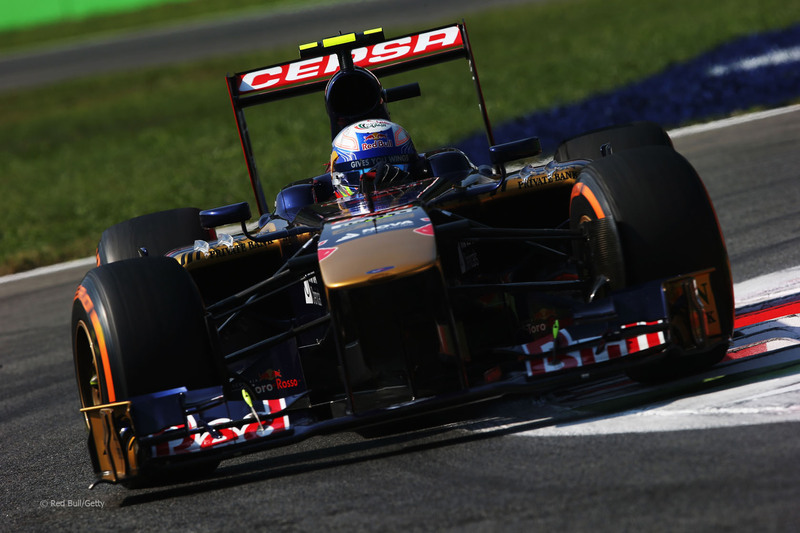 It’s that speed which makes the Italian GP one of the more exciting during the season. While one would typically associate high top speed with the Mercedes and Ferrari powered teams, it was the Renault powered Red Bull team that dominated the weekend with Sebastian Vettel picking up the win. I guess they’re fast on more than just the twisty bits. Shockingly, it wasn’t a Mercedes powered car upfront to start the race but the two Red Bulls led by Sebastian Vettel. And that’s how the race would end with Vettel leading the whole race from lights to flag as a battle for the lead never materialized or threatened to break out at any point after the first chicane. It was Felipe Massa who won big off the start by climbing up to 2nd. Teammate Alonso was able to pick up one spot to fourth. From there, he started picking off the opposition. On lap three, Alonso got by Webber and took off part of the Red Bull man’s front wing. A few laps later, he made easy work of Massa to move up to second. While Vettel circulated up front and Alonso circulated a few seconds up the road, there was a battle for the bottom stop of the podium. The gap between the two RBR cars was so large that the team brought both cars in on Lap 24. They serviced Vettel and got him out before Webber came in so he didn’t lose any time. The unique pit strategy allowed Webber to get the undercut on Massa and take third. And that was the extent of racing. There was a bit of action as Lewis Hamilton pushed forward into the points late in the race but after the first two laps, there wasn’t a whole lot of racing. The field strung out quickly and overtaking, or at least, overtaking shown on TV, was lacking. 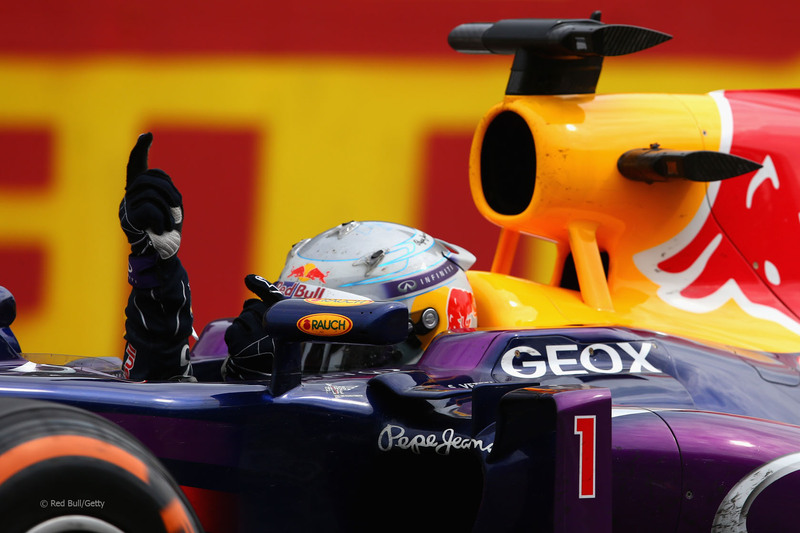 The win was Vettel’s sixth win from 12 races this season. Vettel’s win wasn’t without a bit of drama on the pitwall as Red Bull engineers were concerned that the gearbox on either car would hold together. 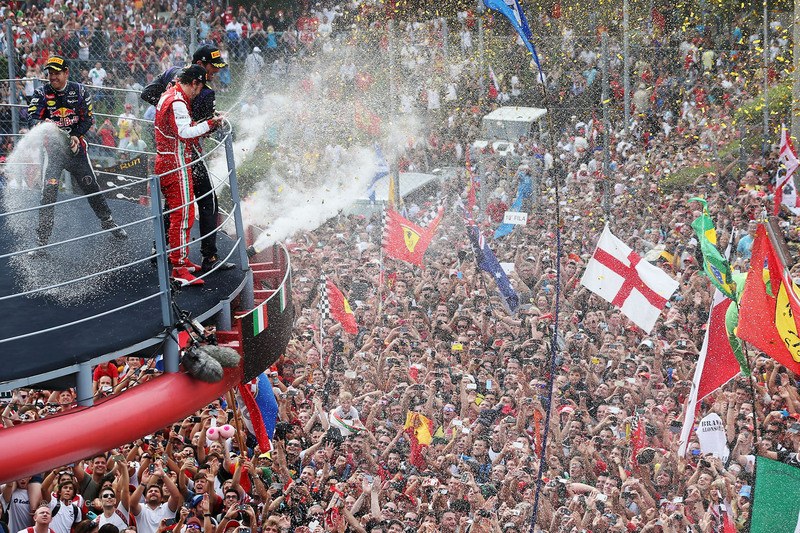 Fernando Alonso was the lone red-suited man on the podium after crossing the line in 2nd. Mark Webber rounded out the podium in his final Formula One race in Europe. Felipe Massa’s fourth place finish was much-needed with his seat up for grabs next season. Nico Hulkenberg, the man tipped by many to take Massa’s seat at Ferrari next season, scored Sauber’s best finish of the season with a 5th. Nico Rosberg finished where he started in 6th. Daniel Ricciardo matched his career best finish in 7th. Romain Grosjean finished 8th. Lewis Hamilton recovered from missing Q3 with a 9th place result. Jenson Button rounded out the points in 10th. By the way, Vettel was booed while on the podium. That didn’t bother Vettel too much. He said that was to be expected when the winner wasn’t driving for Ferrari. Last year, Lewis Hamilton was booed after winning and many members of the British-based Formula One media said it was disgraceful that a race winner would be booed. No, that’s just the hometown fans booing because their boys didn’t win the race. Do we berate wrestling fan who boo the bad guys or soccer fans who boo an opposition goal? No. At least Vettel knows the score with Italian fans at Monza. The FIA circulated a preliminary version of the 2014 F1 race calendar to the teams ahead of this weekend’s Italian Grand Prix. Next year’s provisional calendar will feature 21 races with the return of 18 of the 19 races on the current season’s schedule and the addition of the Austrian Grand Prix, Russian Grand Prix and the unexpected return of the Mexican Grand Prix. 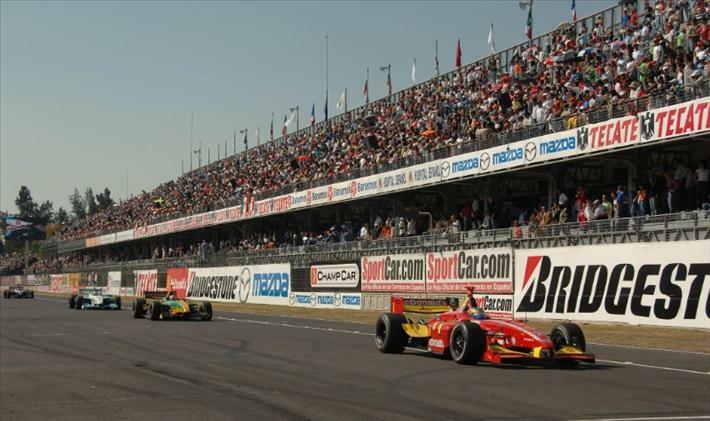 Off the schedule from this year is the Indian Grand Prix though it is unofficially expected to return in 2015 assuming that concern over local tax laws are alleviated. Currently, Mexico, Russia and Korea are only provisionally on the calendar. The Korean GP is to be moved up from its current October race slot to April. Presumably, the race is provisional pending all the necessary regulatory approvals to change the race date. The track in Sochi still has to be completed and inspected before hosting the race. And the Autodromo Hermanos Rodriguez in Mexico City needs to be renovated to bring it up to F1 spec before the race can go ahead. 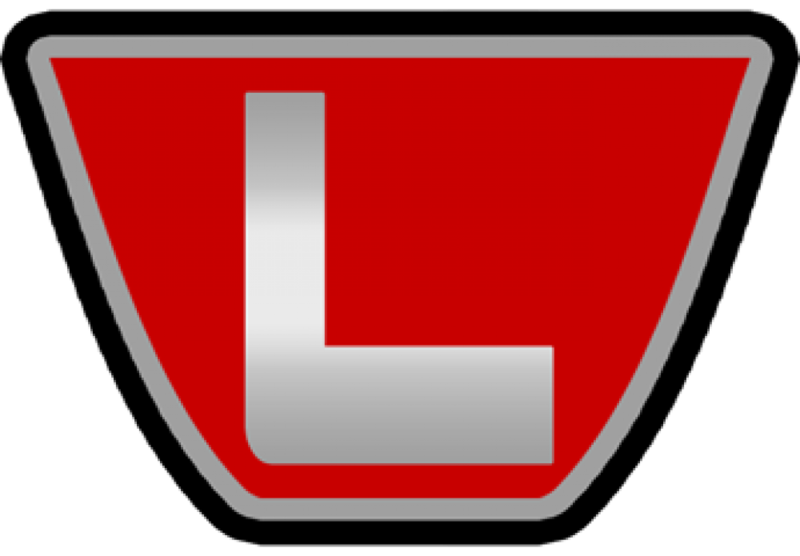 Interestingly, the calendar also indicates that the scheduled track rotation for the Spanish and German grands prix won’t be occurring. Both races are scheduled to run at Barcelona and Hockenheim for the second straight year rather than rotating to Valencia and the Nurburgring. Both venues are in money trouble so this looks like another money move by Bernie. Left off the schedule is the Grand Prix of America in New Jersey. The track has been undergoing preparation for the last couple of year but it doesn’t seem to be coming along as quickly as Bernie hoped. Currently, there is still hope that the race will eventually happen but I wouldn’t put any money on it. It’s interesting that the FOM/FIA is allowing for a 21-race calendar considering that the teams recently said that they didn’t want more than 20 races in a season. With the possibility of even more races being added in 2015, we’ll have to see if next year’s calendar will be reduced to 20 or if the season will just get longer from here. Red Bull made it official right before the start of the weekend that Daniel Ricciardo would take over the #2 seat at Red Bull Racing from Mark Webber when the Aussie driver retires at the end of the season. Webber previously stole a bit of the thunder from this announcement by letting us in on the secret back at Belgium. Ricciardo’s promotion to the big team from Toro Rosso isn’t a surprise as Red Bull set up Toro Rosso as a feeder team to RBR. However, this is the first time that Red Bull Racing will have two Red bull development drivers in the race seat. Previously, Red Bull had the likes of Christian Klien, Tonio Liuzzi and Robert Doornbos in a race seat but that was alongside the likes of David Coulthard and Mark Webber. Given how little faith that Red Bull Racing has had in the drivers in the developmental program, this is a big step and a big risk for the whole Red Bull racing organization. Ricciardo has looked fairly good in the last couple of races. Now, we have to see if the potential that Red Bull has seen in him will translate to next season. 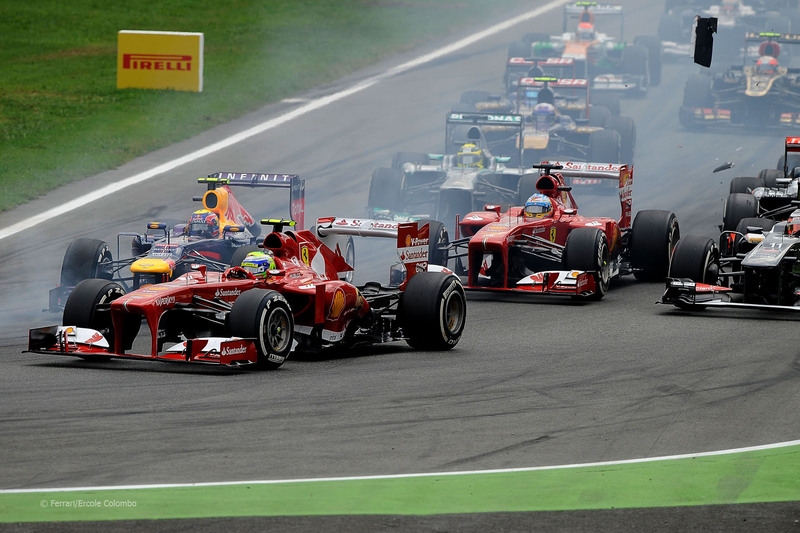 The next round of the 2013 Formula One World Championship is the first of the end-of-season flyaway races. 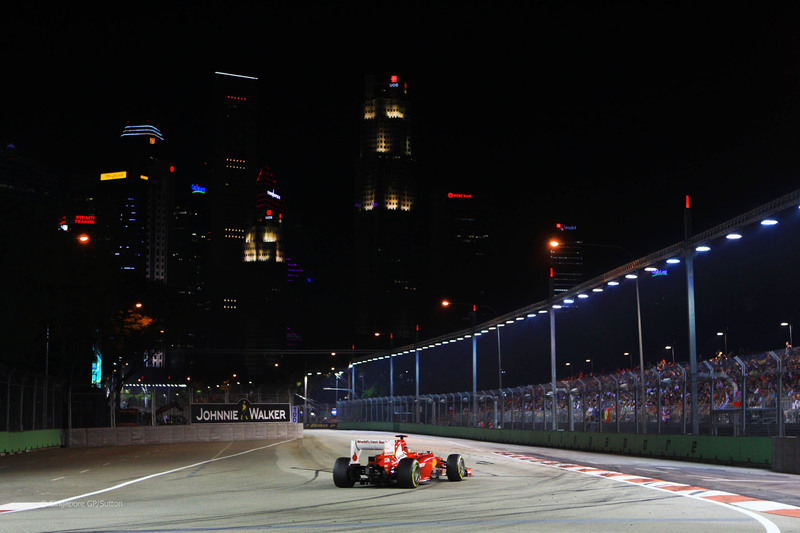 In two week’s time, it’s a return to the street circuit in the city-state of Singapore for the Singapore Grand Prix. The race is often characterized by a lot of brake wear and mechanical issues due to the quick straights, tight turns and high heat and humidity during the race. This year, the track will see a slight reconfiguration as the tight chicane designed to string the cars out before the bridge is being changed into a long left turn. The last two races in Singapore have been won by Sebastian Vettel so I wouldn’t expect any change in that this year. With wins in Monaco and Hungary, the Mercedes team is likely to give RBR a challenge for the win as they’ve proven that they can run on tight tracks where passing is difficult.